Who would have thought gardening could bring so many laughs? Have you ever grown a plant that closes its leaves when tickled? Magnificent Christmas gifts for kids, these interactive, pet like plants are easy to grow indoors year round for fun that just doesn’t stop. These unique plants actually close their leaves and lower their branches when you tickle them. 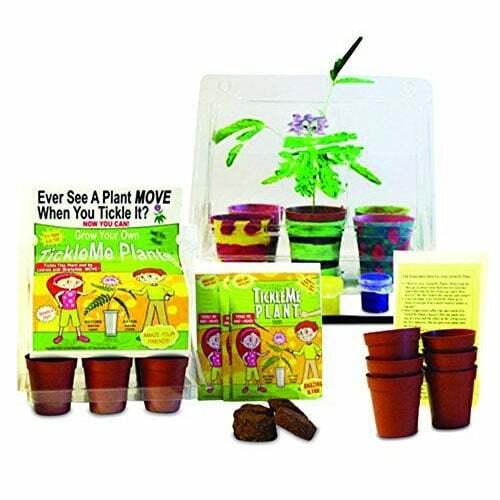 The TickleMe Plant grows inside its own little greenhouse, and the kit includes an acrylic 6 color paint set with paintbrush so you can have fun painting the flower pots and greenhouse as your pet plant grows. This Christmas, the kids can start to grow an interactive plant from seeds and watch it develop into a real live attraction. It will change the way they look at plants forever. Designed for kids of all ages, this is a great activity for the gardener and artist in us all.